Disparaging reports linking high prevalence of cancer to brackish water in Malwa belt of Punjab, Chief Secretary SC Agrawal has said a Health Department report had found that there was no link between water and the disease. The Australian government has given its firm commitment to ensure proper security and safety to students studying in Australia. The Patiala police today claimed to have arrested five members of a gang, including three women and two children, involved in thefts and robberies in parts of Punjab and Haryana and recovered two-dozen laptops, six mobile phones and a .315 bore pistol from their possession. Commuters were put to great hardship as state-owned Punjab Roadways employees, including drivers and conductors, today observed a daylong strike, seeking higher wages.The Punjab Roadways has a fleet of over 1,800 buses. "The strike was complete and no state-owned bus is plying in and out from the state," said Punjab Roadways Workers’ Union general secretary Mangat Singh. As many as 20,000 police personnel, including hundreds of women, have been deployed at the venue of the much-publicised Shiromani Akali Dal (SAD) rally at Kili Chahal village in Moga district on December 18. The proposed swapping of newly carved out Amritsar (East) constituency and Batala assembly seat between the ruling alliance partners doesn’t seem to have gone down well with the SAD and the BJP cadres in these constituencies. Traditionally a Congress bastion, the Jalandhar (West) constituency saw a change in the 1997 elections when BJP’s Chunni Lal Bhagat won, defeating Congress’ Mohinder Singh Kaypee with a margin of 7 per cent votes. The constituency had been ruled by the Kaypee family since the 1980s. The colour of the turban has become a political narrative, each symbolising the wearer’s alliance with a particular party. All Congress men tie the white turban. White is a part of the dress code prescribed for the Congress leaders by the party high command and most senior Congress leaders religiously follow this dress code. People's Party of Punjab (PPP) president and Sanjha Morcha chairman Manpreet Singh Badal today underscored the need to end vendetta politics in Punjab. The Punjab Congress has finalised its draft manifesto that has proposed special measures for the poor and the unemployed besides promising continuation of the free power and ‘aata dal’ schemes. On the occasion of Vijay Divas, the Congress' Punjab unit today tried to woo ex-servicemen ahead of the coming assembly polls. While party's national secretary Praveen Dawar said that former soldiers had the capacity to stand as party candidates on their own merit, the Punjab Congress Committee promised institution of a separate department under the Chief Minister to look into their issues in case it was voted to power. The Right to Education was laying special focus on bringing children with special needs in the mainstream education and Punjab had taken the lead by enrolling such 99,853 students, claimed Secretary (School Education) Husan Lal. With the SAD-BJP government “ignoring” the industry in the state, a number of industrial units have started migrating to other states, which are offering massive tax concession. Perturbed over the indifferent attitude of the government, a majority of the industrialists rue that while the farming sector is being given power subsidy and other concessions, the industrial sector is being ignored. A six-year-old boy was killed and 10 others were injured when buses of Lemon World School, Landran, and Continental Group of Institutions, Jalbehra, collided head-on at Chuni village on Fatehgarh Sahib-Chandigarh highway today morning. About three days before PUNSUP was to recruit inspectors on the basis of a walk-in interview, the Punjab and Haryana High Court today stayed the process. The interviews for the appointment of inspectors on contract basis were scheduled to be held on December 19. The Punjab and Haryana High Court today put on notice the Punjab Government and the Secretary, Vigilance, on a petition seeking guidelines for appointment of Chief Director, Vigilance Bureau. Speaking to The Tribune on the sidelines of a two day workshop on "Sustainable Water Supply and Sanitation Services" that concluded here today, the Chief Secretary said the Health Department carried out an "exhaustive" survey covering the people in affected Malwa areas, including Bathinda, Muktsar, Mansa, Ferozepur, Moga, Barnala, Faridkot and Sangrur. "No link between cancer and the quality of water was found," he said. Agrawal said, "We agree that the belt definitely has high incidence of cancer, but the total average is far less than the national average." He quoted a national average data of the Indian Council of Medical Research, Delhi, which showed that there were 10 to 40 persons per lakh in Punjab who had been found suffering from carcinogenic diseases against the national average of 90 to 100 persons per lakh. Countering the Chief Secretary's claims, Kheti Virasat (NGO) chairman Chander Prakash said the "government claims defied the ground reality". An Assistant Professor at Punjab Technical University in Jalandhar, Prakash said, "I am surprised at the findings of the report. In the past, a Guru Nanak Dev University (Amritsar) study confirmed the presence of uranium in water samples. It also reported heavy presence of fluorides, which is evident from the condition of the residents' teeth in Malwa belt." Subsequently, a Punjab Agricultural University (Ludhiana) report pointed out the presence of arsenic, which is also associated with cancer, he claimed. A Central Pollution Control Committee report, too, indicated that the water in Malwa belt was unfit for consumption. The Australian government has given its firm commitment to ensure proper security and safety to students studying in Australia. The assurance was given by Officer of the Order of Australia (AO) and Secretary, Australian Department of Foreign Affairs and Trade, Dennis Richardson during a meeting with Minister of State for External Affairs Preneet Kaur in New Delhi today. Giving details of the meeting in Patiala, MP Singh, Additional Private Secretary to Preneet, said, "While discussing several bilateral issues, the Minister raised the long-pending issue of the transport concession to be extended to Indian students in the Federal States of Victoria and New South Wales. The authorities in these two Federal States have been consistently refusing to grant concessional transport facilities to Indian students, which are normally enjoyed by the Australian students, despite the fact that Indian students pay much higher fees compared to domestic students." Responding to the matter, Richardson assured that the matter of granting transport concession to Indian students would be taken up suitably with the concerned authorities in the Federal States for their consideration, in view of the fact that the Indian students pay comparatively higher fees than the local students. "Richardson informed Preneet that the Australian Government has undertaken extensive review of the international education sector, including re-registration of international education providers with a view to ensure that international students get quality education in Australia", stated Singh. After the meeting, Preneet expressed her satisfaction regarding the measures put in place by the Australian government to improve the safety and security of the Indian students in Australia. She, however, impressed upon the need that the proposed measures were followed through and resulted in a qualitatively improved experience on the ground for the Indian students in Australia. Addressing media persons at the CIA Staff office, Patiala SSP Gurpreet Singh Gill said that the gang members used to break open windowpanes of a vehicle and steal valuables from it. "The gang was active in parts of Ludhiana, Haryana, Patiala and Jalandhar", he added. The accused have been identified as Anita, Poonam, Prasati, Ritik and Rohit. "Two members of the gang are still to be arrested and they have been identified as Sagar and Suraj," the SSP said. Patiala Deputy Commissoner Vikas Garg today suspended four employees of the DC office, who were found drinking in the office complex late yesterday evening. The employees include DCs personal assistant Satnam Singh, Ravinder Singh and Gurnam Singh, stenos of the ADC, and Kesar Singh, clerk at Patiala tehsil. These suspended employees would now give their attendance at the SDM office, Patran, which is 60 km from Patiala. Notably, SDM Anil Garg received a complaint that few officials used to drink at the DC office complex after the office hours and therefore, he conducted a surprise raid yesterday evening and caught these employees red-handed. Meanwhile, employees owing allegiance to different workers unions of PEPSU corporation and Chandigarh Transport Undertaking (CTU) too joined the protesting employees. The striking employees are also seeking pay parity with revenue officials, special allowance and conveyance allowance on a par with clerks and JBT teachers. The employees warned that they would step up their agitation if the next Cabinet meeting failed to take measures in their favour. In Jalandhar, 222 buses of the Punjab Roadways, including the kilometre scheme buses, remained off road. The buses remained parked at the Jalandhar-I and II depots where the employees staged a dharna. In Amritsar, 650 state-owned remained off road. The protesting employees blocked entry of private buses to the bus stand, which added to the passengers’ woes. Similar reports were received from Patiala, Ludhiana, Bathinda and other parts of the state. A giant poster of the CM and his son. As many as 20,000 police personnel, including hundreds of women, have been deployed at the venue of the much-publicised Shiromani Akali Dal (SAD) rally at Kili Chahal village in Moga district on December 18. Sources in the police department said that several police teams had been constituted for providing security, regulating traffic and keeping an eye on trouble-makers. Reliable sources said hundreds of policemen would provide security at the dais where the VVIPs would be seated. Local Congress MLA Joginder Pal Jain alleged that the Akalis had summoned more than 40,000 policemen here, many in mufti, to demonstrate a huge gathering at the rally. “No officer is seen in his office and the police stations are empty too,” he added. Huge tents have been pitched at the venue and nearby buildings taken over to house the huge police force. Patrolling on the Moga-Jagraon highway has been intensified. 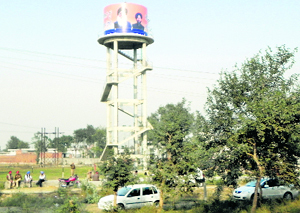 Plastic banners with photographs of Chief Minister Parkash Singh Badal and SAD president Sukhbir Singh Badal dot the trees along the highway even though the state government had banned the use of plastic. Big posters of the CM and his son have been pasted on public buildings, including a public water tank bang opposite the rally venue, despite the election commission orders instructing district administrations across the state to remove banners and posters from public places. While the SAD workers are protesting the move in Amritsar (East), the BJP activists are up in arms in Batala. The local SAD leaders have already held a meeting and even passed a resolution, appealing SAD president Sukhbir Badal to retain Amritsar (East). They contended that this constituency has been carved out of areas falling under Verka, Jandiala and Amritsar (South) constituencies, all of which were represented by SAD MLAs. According to them, Amritsar (East) had got merely two wards from a seat represented by the BJP: Amritsar (North), Anil Joshi is the MLA. They claimed of the 1.3 lakh voters of this new constituency, the number of Sikh voters was around 60,000 while that of Hindu voters was not more than 30,000. “The BJP already has three urban seats in its share IN the form of Amritsar (Central), Amritsar (North) and Amritsar (West),” they said. Chief Parliamentary Secretary and Amritsar (South) MLA Inderbir Singh Bolaria and district SAD president Upkar Singh Sandhu were prominent among those who attended the meeting. SAD secretary Daljeet Singh Cheema said any decision in this regard would be taken keeping in view the party’s interest and not that of any individual. The decision by the SAD to take away Batala assembly seat from the BJP fold has not only forced the BJP district president Vivek Modgil to go on a fast unto death but has also left sitting BJP legislator Jagdeesh Sahni fuming with anger. Modgil, whose fast entered the third successive day, claimed that he would keep on protesting till the “powers-that-be ensure that Batala remains with the BJP”. He claimed that out of the 23 seats given to the BJP, Batala was the safest and that “even the SAD candidate would bite the dust if Batala is taken away from the saffron party”. On the other hand, Jagdeesh Sahni is all set to play the rebel if the seat is given to the SAD. Sources say if Sahni played the rebel, he may damage the party’s chances in at least three assembly segments: Pathankot (his hometown), Bhoa and Dinanagar (all represented by BJP). While Darshan Singh Kaypee had won the 1975 and 1980 elections, Mohinder Singh Kaypee had turned victorious in the 1985, 1992 and 2002 elections. Since 1997, the Congress and the BJP have been winning the seat alternately. Sitting BJP MLA Bhagat rode to power on a wave of popularity but mounting development issues has left the voters disappointed. The BJP infighting has made matters worse and the party may find it hard to hold on to this seat in the coming elections. Bhagat Chunni Lal’s son Mahinder Bhagat is being projected as the BJP candidate for the seat. The Bhagat camp faces a strong challenge from the Vijay Sampla faction. Sampla has been vying for the party ticket through his Bharat Gaurav Morcha for the past two years. The infighting is said to have adversely affected development in the area. Projects & Promises Considered one of the most under-developed constituencies, the old basti areas have been included in this constituency after delimitation. Areas like Bhargo Camp, Basti Danishmandan, Mithu Basti, Jallowal Abadi, Kot Sadiq, Rasila Nagar and Raj Nagar face acute pollution (industrial units) problems besides those of poor sewerage and inundation. At least 10 road projects are underway in the area but most have hit snags from time to time. The colour of the turban has become a political narrative, each symbolising the wearer’s alliance with a particular party. All Congress men tie the white turban. White is a part of the dress code prescribed for the Congress leaders by the party high command and most senior Congress leaders religiously follow this dress code. But the new generation of Congress leaders are more colourful. For example, Pradesh Congress chief Amarinder Singh prefers the colour purple. Parrot green is his other favourite. Likewise, Partap Singh Bajwa often dons a colourful turban with his immaculate white kurta-pyjama. Jagmeet Brar invariably has his turban and kurta of the same shade. In the past, the Congress men were always clad in the humble khadi. Now they wear starched designer clothes, including jackets, made from high-grade cotton. Branded shoes is another fad with them. The colour blue has always been the trademark of the Akalis. All Akali leaders don blue turbans with white kurtas. Chief Minister Parkash Singh Badal always ties a starched blue turban. Simranjit Singh Mann prefers a dark blue turban. A few Akali leaders, such as Jagdev Singh Talwandi, are always in a black turban. The Akalis started tying black turbans during the Jaito Morcha and the Punjabi Suba Morcha as a symbol of protest. However, in the 1980s, known as a radical period in Sikh politics, a section of the Akalis started tying saffron turbans. Some of them, like Sukhdev Singh Dhindsa, continue to do so. The communists predictably tie turbans that are deep red.Their party flags are of the same colour.The newly formed People’s Party of Punjab has opted for deep saffron to symbolise the spirit of sacrifice as personified by Shaheed Bhagat Singh. While PPP leader Manpreet Singh Badal ties a mustard turban, his partymen don kesari straps on their turbans.This concept has been borrowed from the Red-shirt protesters in Thailand. Activists of major farm organisations in Punjab prefer green turbans. The colour is associated with the farm sector. Addressing an "Izzat Sambhal" rally organised by the Sanjha Morcha at Khanna today, the PPP chief said the people's money "siphoned off" by SAD and the Congress would be put back in the state coffers if the Sanjha Morcha comes to power. He said that those who had "looted the people of Punjab should not be allowed to go scot-free". Castigating the SAD-BJP Government for their flurry of policy decisions in the past few weeks, he claimed that the government was not in a position to fulfill its promises. "It's an open secret that the projects that have been initiated will never be completed," he said, while addressing a gathering of more than 12,000 people in the rally. Talking to mediapersons on the sidelines of the rally, he said the adjustment of seats among the constituent parties of the Sanjha Morcha for the ensuing Assembly elections would be worked out mutually. Making a jibe at the December 18 Moga rally of SAD (B), he said, "What's a rally? It's equal to (the availability of) diesel." The party is clear that it will not make any promise it cannot keep. Pradesh Congress president Capt Amarinder Singh, who has been camping in Delhi to discuss issues to be included in the manifesto, told TNS that all proposals would be vetted and cleared by the Congress president which would then be forwarded to a committee headed by Finance Minister Pranab Mukherjee. The committee is expected to take into account the finances involved and also chart out a plan to make the proposals viable in the long run. Capt Amarinder said there would be special measures for the poor in the manifesto, indicating the party proposed to launch more populist schemes in Punjab. He, however, emphasised that it was not about populism but social responsibility. “We need to give more facilities to the Scheduled Castes”, he said. The main thrust of the manifesto would be removing unemployment with the state Congress projecting a figure of 27 lakh unemployed youth in the state. The PCC president said: “We are building our industrial policy around this”, adding the proposed agriculture policy would also be geared up to increase employment opportunities in the state. Questioned on the possibility of unemployment dole , he said: “ We will release the manifesto in mid-January” or it would be imitated by the SAD-BJP combine. 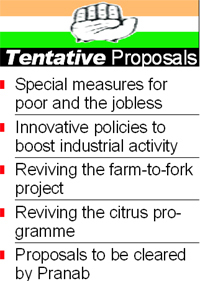 He said innovative policies would be proposed to boost industrial activity besides introducing single-window clearance. The party was committed to re-introducing the farm-to-fork project that was proposed by Reliance but could not take off during the previous Congress government. Amarinder said the citrus programme launched by the last Congress government would also be revived. He said the programme had been unfairly closed on the plea that the citrus strains were not successful in Punjab. “If that was so, Chief Minister Parkash Singh Badal would not have grown them over 100 acres of his land”, he remarked, claiming that the citrus programme had been allowed to die because the CM was interested in importing Israeli technology. An interaction with ex-servicemen following a programme that was presided over by State Ex-servicemen Cell chairman Maj Gen (retd) GG Dwivedi and convener Capt GS Jawandha revealed that a number of ex-servicemen were claimants for Congress ticket. Pointing to his pocket, AICC secretary Praveen Dawar said he had been given the names of a number of ex-servicemen who were keen to contest the elections. He said he did not advocate any reservation for ex-servicemen "but the large number of former soldiers had created winnable candidates in the category". Among former soldiers aspiring for party ticket is GS Jawandha (Dhuri seat), who is the political heir of former legislator Zaildar Sant Singh. Another ex-serviceman, Malvinder Singh, who was also present at the function, is an aspirant from Patiala (rural) seat. He is the brother of PCC president Capt Amarinder Singh. He said he was asking for party ticket on the basis of work done by him in the area since the last 10 years. Capt Bikramajit Singh, a Shaurya Chakra awardee, has also emerged as a strong candidate from Tarn Taran seat. His grandfather Gurwaryam Singh was a legislator and an SGPC member. Others officers in the fray include Col Babu Singh from Nihansinghwala and Major Amardeep Singh, who is an aide of PCC president Capt Amarinder Singh, from Gurdaspur. Earlier at the Vijay Divas function, Air Marshal Randhir Singh said those running the state must work to make former soldiers employable. Malvinder Singh, who read Capt Amarinder Singh's message on the occasion, said a new department would be set up under the chief minister to look into all the problems of ex-servicemen and that demands of one rank one pension and the issue of employability would be taken up with the Prime Minister soon. The Punjab Congress would lead a delegation to the Prime Minister and the Defence Minister in this regard, he added. Bathinda: BJP ministers and senior functionaries are making no efforts for the success of the SAD’s Moga rally, being too busy with preparations for their own rally at Jalandhar on December 24. Although partners in government, the SAD and BJP are holding separate rallies to mark the launch of their election campaigns. Transport Minister Surjit Jiyani alone has provided about 100 buses to the SAD for ferrying activists from Fazilka to Moga.The BJP leaders have fanned out into their respective constituencies to mobilise support for the Jalandhar rally. Maur Mandi (Bathinda): Chief Minister Parkash Singh Badal held Sangat Darshan here on Friday to introduce Irrigation Minister Janmeja Singh Sekhon, the party candidate for the Maur constituency, to the local people. Badal said this Sangat Darshan was his last as the code of conduct could be imposed any time now. He described Sekhon as a trusted soldier. Badal denied talks with Dera Sacha Sauda in view of the elections. Asked whether the government would remove his photographs from government vehicles, Badal said he would obey every EC order in letter and spirit.He said the Sanjha Morcha would be wiped out in the elections. He said Manpreet being a defector himself encouraged defections. According to them, on account of “wrong policies” of the government, as many as 650 medium and small industrial units have shifted to the neighbouring state of Himachal Pradesh in the past couple of years. Besides, it is learnt that about 700 expansion units of the existing industry in Punjab are being set up in other states, mainly on account of the imposition of heavy taxes by the Punjab Government and erratic and costly power. Industrialists of Mandi Gobindgarh, Ludhiana and Patiala say the state industry has been suffering on account of frequent power cuts, non-implementation of provisions of the Punjab Industrial Policy (PIP) and non-redressal of genuine problems of the industrialists. Badish Jindal, president, Federation of Punjab Small Industries Association, said cross-subsidy charges of 20 per cent were being levied on power tariff on the industrial consumers to extend the benefit of free power to the farmers. “Because of the imposition of four-day weekly off on induction/arc furnaces as a power regulatory measure, the production has suffered drastically,” said Mohinder Gupta, president, Mandi Gobindgarh Induction Furnace Association. “In the past four years, power tariff for the industry has gone up by 35-40 per cent that has badly hit the state industry,” said Naresh Gupta, president of Patiala Industries Association. “Besides, it was promised in the Punjab Industrial Policy in 2009 that 75 per cent areas of the state from where the industry was operating would be designated as industrial areas to resolve issues pertaining to the mixed land use, but nothing has been done till date,” said the industrialists. A visit to the Patiala Industrial Focal Point is enough to expose the claims of the state government in providing requisite infrastructure in industrial areas. Initiated in 1996, the Focal Point was to come up on 200 acres. At present, there are 350-400 small and medium units, mainly catering to the cutting tool and plastic recycling industries. The roads are in bad shape and the government has failed to set up a common effluent treatment plant. There is not even a fire station in the area. Paramjit Singh, former president of the Patiala Focal Point Industries Association, said, "It is really sad that despite paying so much taxes, the state government is least bothered to redress our genuine concerns". The college bus was carrying staff and students from Chandigarh to the college campus. Six staff members of the college were among the injured persons, who were rushed to Civil Hospital here. The deceased has been identified as Jaskarn Singh, son of Ramandeep Singh, a resident of Nogawan village. The other injured school students were taken by their parents to private hospitals. Immediately after the accident, an ambulance reached the spot and took Jaskarn Singh to Ivy Hospital in Mohali, where he succumbed to his injuries after two hours. After conducting the postmortem, his body was handed over to his parents and was cremated in the evening. Hans Raj, SHO, Bassi Pathana said on the complaint of Palveer Singh, school bus driver, an FIR was lodged against Jatinder Singh, bus driver of Continental Group of Institutes, under sections 279 and 304A of the IPC. The order by Justice Tejinder Singh Dhindsa came during the hearing of a petition filed by Sandeep Bansal and another resident of Mansa. Dubbing the recruitment process as “illegal and arbitrary”, the petitioners submitted that in April, PUNSUP advertised 143 posts of grade-two inspectors to be filled up on regular basis. The petitioners cleared the written test and the candidates were called for third counselling between December 12 and 14. But in between, PUNSUP inserted an advertisement to invite candidates to fill more posts on contract basis through walk-in interview, counsel Kapil Kakkar and Hema Kakkar contended. They added once regular recruitment was underway, the corporation’s act of filling the posts on contract basis was unjustified. Moreover, the advertisement issued by the corporation in a corner of a newspaper among the classified ads, and that too without mentioning the remuneration, was nothing but an attempt to adjust their favourities through the back door. Chief Justice Ranjan Gogoi and Justice Surya Kant also issued notice to the Chief Director, Vigilance Bureau, for February 17. The notice came on a PIL filed by advocate HC Arora, contending, "The post is presently occupied by a police officer in the rank of Additional Director-General of Police, who is facing certain criminal charges for which charges have also been framed, which indicates that the existing procedure for appointment of Chief Director, Vigilance Bureau, is deficient". Arora was seeking directions to the State Government "to prescribe a procedure for appointment of Chief Director, Vigilance Bureau, including his tenure on the post". The petitioner contended that the directions should be issued in the light of principles laid down by the Supreme Court of India in the case of Vineet Narain and others versus Union of India and another and also in Parkash Singh versus Union of India and others. Referring to the judgments, the petitioner contended the procedure for appointment of Director, CBI, and the State Police Chiefs was laid down in the verdicts. It included their tenures on the posts. The PIL said: "There is no reference to the post of Chief Director, Vigilance Bureau, Punjab, any where in The Punjab Police Act, 2007. No distinct provisions have been made for appointment to the post of Chief Director, Vigilance Bureau, Punjab. "A perusal of the provision contained in Section 15 of The Punjab Police Act, 2007, shows that all other senior functionaries of Police Department, that Inspector-General of Police, Deputy Inspector General of Police etc. can be removed or transferred from their present post once the charges are framed against them by a Court of Law. "The provisions have not been specifically made applicable to the post of Chief Director, Vigilance Bureau, Punjab, although all officers in the Vigilance Bureau, Punjab are taken on deputation from Punjab Police."